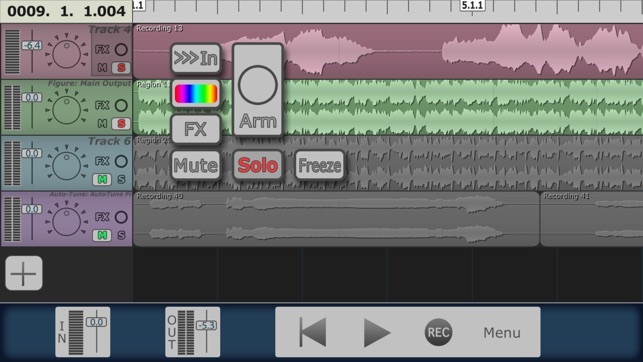 The power of a digital audio workstation in the palm of your hand. Release your creativity with up to 24 high quality audio tracks. Record multiple takes, harmonies, solos, and experiments. No more worrying about bouncing - each instrument can have its own track. More cowbell? No problem! Build new songs just like in a real recording studio, with the monitoring and overdubbing capabilities of MultiTrack DAW. Move and trim audio until it's perfect, and mix the sound until it's just right. Share your creations with iTunes File Sharing, Wifi, email, and SoundCloud. MultiTrack has a wide range of input capabilities, including the built-in mic, headset mics, and USB interfaces and mics. Please see our support forum for a list of supported input devices. File types for import include mp3, wav, aac, m4a, aif, and m4a. MultiTrack now offers 7 ways to get audio files in and out: iTunes File Sharing, Wifi, Copy/Paste, "Open in...", Email, Music Library Import, and SoundCloud. 8 stereo audio tracks, upgradable to 24. Up to 24 bit / 96kHz, professional quality sound for each track. 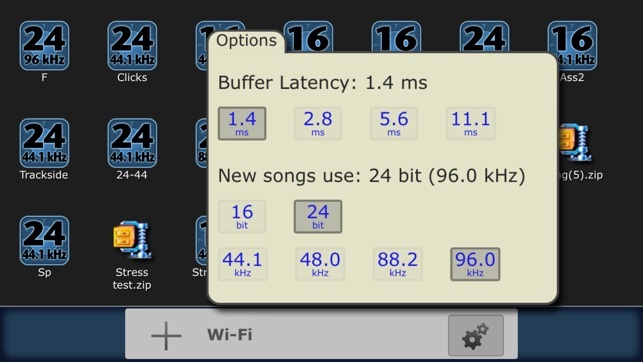 Inter-App Audio - Generators, Instruments, and Effects supported. 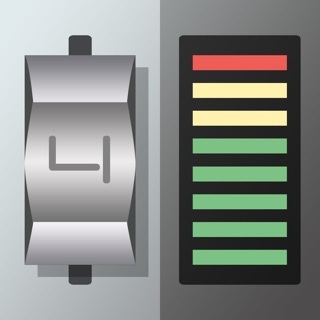 Audiobus 2.0 - Can be used as a sender for any track or master out. Supports saving and restoring state. Non-linear, non-destructive editing using Regions and Bins. Sweet Reverb and configurable stereo Delay available as bus effects. Grid View with Snap to easily align regions. 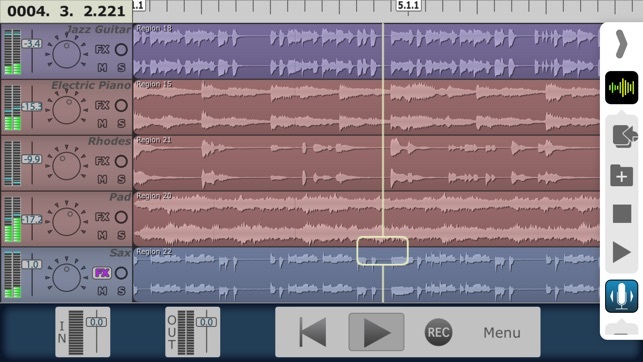 Freeze tracks for improved performance and to free up the IAA plugins for use on other tracks. Ruler showing bars/beats/divisions/ticks or timecode. Individual controls for volume, pan, mute and solo. Volume faders have +12db of gain boost. Input selection allows splitting stereo input onto 2 mono tracks. Ability to monitor the input signal with effects. Bounce Regions using multi-region copy and paste. Looping with the Loop Markers. Hotbox popup control with context sensitive buttons. Audio Browser allows preview of audio files in the song. Snap, Punch, Input Monitor, Auto Input, Undo and Redo, and many more features. Smart Snap displays red vertical lines with exact snapping placement, snaps to any other region or ruler line. Beautifully rendered waveforms at multiple zoom levels. Low latency VU meters for each track. 32 bit / 64 bit audio processing. Unified Copy/Paste system means internal copying works in other apps. Latency compensation with selectable buffer sizes. Recorded material perfectly synced with other tracks. Fades use quadratic interpolation in dB space. Fully Bit Transparent when faders set to 0dB. Zip compression of song projects for backup/restore. Sharing of Zipped songs with AirDrop or "Open In..."
USB Audio using Camera Connection Kit or Lightning to USB Camera Adapter. Wav, Ogg, and m4a compression for Wi-Fi download, mixdown, email attachments, and SoundCloud upload. "Sound Copy" app extension allows copying audio to the General Pasteboard (Intua format) from outside MultiTrack. * iPod Library Access is read-only, and cannot read DRM protected files. Preamp gain controls how much signal is sent to IAA track effects. Effect Knob drag types (horizontal, vertical, or both). Option available in Settings App. IAA Track effects now work on underlying regions of armed tracks as well as input monitor. "Sound Copy" App Extension, converts audio to wav and copies to the general pasteboard from outside MultiTrack, including ogg files. Tempo Controller redesign, separate spinner controls for Ruler type and Display type, 'Accent' button to accent the first beat of the bar. MultiTrack now rotates 5 backups of a project. If anything goes wrong, the latest backup is loaded. Improved Input Selector box now groups core audio inputs, IAA effects, generators, instruments, and Audiobus sources. Waveform previews are now built while recording, instead of after. No waiting for a lengthy preview build after long audio recordings. Bins and Regions are named by track and take number, or audiobus source port names. 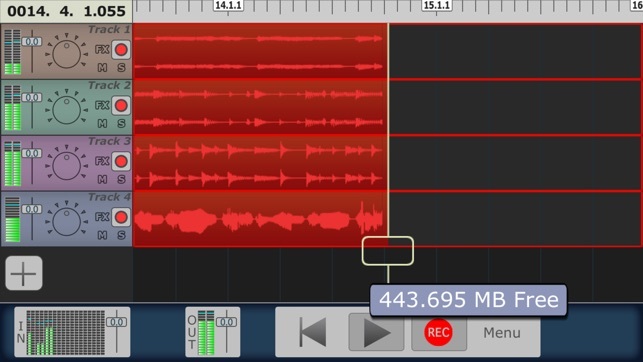 MultiTrack can now be launched into the background, when hosted from another app. Now supports retina 3x displays on iPhone 6+, 6S+, and 7+ (5 tracks visible). iPad pro displays 11 tracks landscape and 15 tracks portrait. Bluetooth A2DP and Airplay now works for iOS 10 devices (enabled in the Menu). Non-Exclusive solo, now you can solo as many tracks as you want. Select from the 3 different built-in microphones on newer devices. 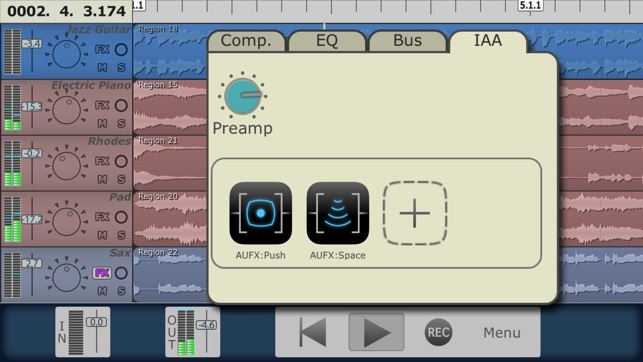 Reworked IAA plugin system for better stability and compatibility with particular apps. Updated for iOS 10. Audiobus 3 ready. Fix: email bug when sending large files on certain versions of iOS 9. Fix: memory leak when recording with screen locked. Fix: If the song project doesn't match the hardware samplerate, converters are placed around IAA plugins. Fix: To prevent Audiobus disconnections, input ports are now pulled even when track is disarmed or song is closed. Fix: Scaling issue on iPhone Plus when in 'Display Zoomed' mode, introduced in 4.3 version. Fix: Import of video files (mp4) for audio ripping was being excluded, introduced in 4.3 version. Fix: Rare crash bug when freezing/unfreezing tracks while in playback mode. 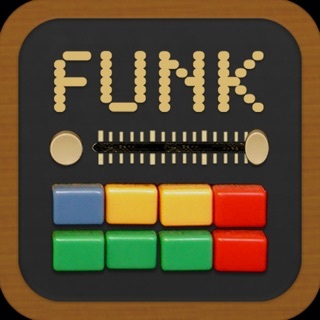 Fix: New Audiobus lib fixes very rare crash bug when loading song. Fix: Waveform previews not displaying correctly after 16 millionth sample. Multitrack DAW was my first DAW! Being discouraged by cost, I never took the initiative to learn how to seriously record. However, once I bought my first iPhone, and then subsequently stumbled upon Harmonicdog’s app, I fell in love with the process! Since, I’ve been constantly learning and growing in the art, and have graduated to using a desktop DAW. It is one of my jobs now, and it’s hard to believe that not that long ago, I was introduced to the process by Multitrack DAW! There is something about this DAW that just works. 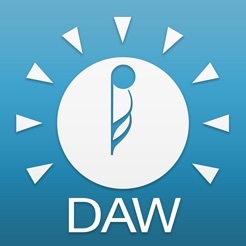 I own several major iOS DAWS but the simplicity and reliability of this app sometimes seems better or more useful than the other big named apps. Sure this DAW doesn’t have near as many features but for what it does, it does it well and that what I like about it. An app that runs smooth, without many crashes and works pretty good with IAA.